Have you ever been watching a movie and found yourself screaming at the parent for being such an idiot for their nanny choice? Now, this does not necessarily mean that things always turned out badly, but there were obvious warning signs that they were either not qualified or not a good fit. Of course, sometimes, the poor decision did cause a tremendous amount of grief. If only a thorough interview would have been done or references would have been checked, to avoid all these problems. Then again, what would a movie be without a little drama? If every mother didn’t already have the fear that their nanny would try to steal their husband and baby, they certainly did after this movie. Peyton Flanders, who is actually the widowed Mrs. Mott, terrorizes the family in the effort to replace the mother. She even secretly starts breastfeeding the baby so he won’t feed from his own mother anymore. Fortunately, this movie ends with the bad nanny being destroyed as she is shoved out an attic window and falls to her death. Fair enough, this movie ends well; the children are never really in any danger and Robin Williams does a fantastic job playing one of the greatest nanny roles of all times. Seriously though, what was she thinking? When Daniel Hillard loses a custody battle over his kids, he has to think of a creative way to see them. His interview with his ex-wife is nothing short of shaky. No one will ever understand why she thought her children would be safe with Mrs. Doubtfire. Worried by the bad behavior of the older siblings trying to kill the new baby, Morticia and Gomez decide to hire a nanny. Debbie Jelinsky is hired since she wasn’t scared off like the rest, but no one knows she is really a gold-digger who has her eye on Fester. She tries to kill this rich bachelor several times, but one of her plans backfires, taking her own life. When Molly Gunn learns that her fortune left behind by her deceased parents, she is forced to get a job. She interviews to care for a very uptight little girl named Ray, and surprisingly, the mother hires her with no experience and no references. Although they form a fantastic relationship and the movie has a sensational ending, this is one nanny that should have never been hired. Working as an undercover FBI agent, Malcolm Turner dresses in disguise as a very large woman to protect a family that is in danger. The only reason he gets hired is because he points out the flaws of the other more qualified candidates. Here is another case of a mother not doing a proper interview. Fortunately, this turned out to be for their own good. When widowed Cedric Brown needs to hire a nanny to care for his seven children, one would think he wouldn’t leave his decision to hearing a mysterious voice in the house telling him who to hire. Sure, the kids begin behaving, but it’s not because they are learning manners from their new nanny, it is because she has magical powers. 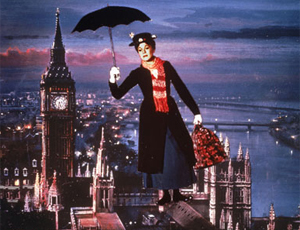 Without a doubt, Mary Poppins is nearly everyone’s favorite nanny. What child doesn’t want to eat a spoon full of sugar to help the medicine go down? That being said, she wasn’t even officially hired! She employed herself, stating that she would try things out for a week before deciding if she would take the position. Clearly Mr. Banks was just mesmerized by her good looks and charming personality. Guest Bio: This article was provided by Nanny.net. Whether you want to become a nanny or hire a nanny, Nanny.net has you covered.